A couple of weeks into our stay on the island of the gods, an itch started to fester and needed to be scratched. With the unlatching of all commitments–beginning with the biggest one of all: our jobs–came also the release of all those desires that had been tucked away and postponed. While the desire to master surfing alone did impose on us a certain discipline–requiring us to be up at early hours of the morning and to return to the shore at near-sunset each day–another aspect of surfing did nothing to restrain the restlessness that resided within us: the prospect of attempting a different spot, and potentially discovering the ultimate wave of our lives. 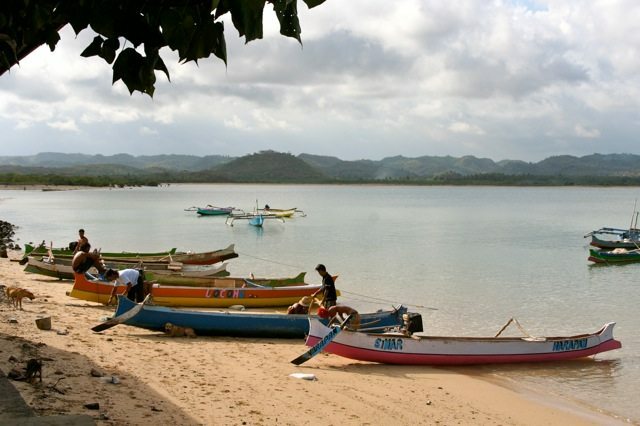 We decided to head over to Lombok, another island on the Indonesian archipelago. After reading and hearing of Lombok being an untouched Bali, or “Bali as it was 30 years ago” and with waves aplenty, we felt compelled to make our visit. As neither G. nor I have reached that numeral age-wise, “Bali 30 years ago” was a non-existent conception. Images of virgin beaches, solitary peaks, rolling waves and everything that Kuta and Seminyak was not started flooding our brains. Adrenal gland overdrive! Lombok was a mere 30 minute flight away from Ngurah Rai International Airport. But what fun would traveling back in time be if you did not experience the older mode of transport and route: by sea? With that, we undertook a 2 hour ride to Padang Bai harbor where a massive ferry could transport you across the Bali Strait. The ride was long, however, with the incessant chatter of our friendly yet knowledgeable Balinese driver it seemed a slight bit more bearable. The suffering did not stop there, however. Oh no no no no. As soon as your feet land on the sandy and bristling hot tar of the street near the harbour, the hassling begins. “You going to Gili? We can take you Gili- cheap and fast!” “Oh you want go Senggigi? Same same- cheap and fast!” “Where you want go- we take you!” Now, if you were in a rush and you did not mind paying about $30 USD per person, you could get to the island in about 2 and a half hours. But if you were like us, with a liberated, unlimited and unfilled schedule in view, you could pay $1 USD and hop on a ride with the rest of the locals, reaching the island at a leisurely, life-enjoying pace of 5 hours. The ferry is a monster of a vessel, with vehicle spaces on its bottom-most deck and three upper-level decks for passengers. It was open-air with very sporadic benches and tables. There were prayer rooms for Muslim passengers and even rooms where you could take naps in. We could not figure out how these nap rooms were administrated, though, as we kept seeing people walking in and out. I suppose these rooms were for passengers who frequently made these journeys and were therefore tired of the scenery. For G and I, crossing the Lombok Strait was a completely eye-opening and novel experience–even if all we saw after the slow disappearance of the Bali coastline and mountains was an empty infinite horizon of blue ocean, listening to the sounds of the vessel engines humming and the rhythmic crashing of the waves onto the sides of the vessel. We found ourselves at Lembar harbor in West Lombok, scrambling for a transfer to Kuta Lombok, the southern part of the island where most of the known breaks are found. Lady Luck fortunately was smiling on our side, as we found a group of other same destination travelers with whom we split the ride. Eight of us were cramped into a seven-seater van, non-airconditioned and having to bear with a bumpy 2 hour ride into the South. At first sight, Lombok did seem a tad under-developed. There was hardly any organized transfer counters at the harbour as you would find in Bali. At certain points of the journey the road became an unpaved, dirt stony one that was flooded occasionally. There were some signs that indicated that progress and development had indeed reached the shores of this forgotten neighbor–the streets were in the process of being widened and many roads were closed due to road work. People were friendlier here than in Bali. The kids and adults we saw along the streets seemed surprised at seeing a bus full of foreigners passing their way and a spontaneous overflow of “hello!” coupled with exuberant hand waves was a common sight. G noted that it seemed that the less incursions and fewer sightings of foreigners, the more genuine the smiles and the hand waves. The skies were turned vermilion orange by the time we reached Kuta Lombok and it was beginning to get dark. The streets in Kuta were still one lane and narrow, with no street lamps except for the little blimps and light overspill from the shops and waroengs that line the streets. If you’re looking for high-level accommodations, you’ve come to the wrong place. The only resort and brand-named hotel in this area is the Novotel. Apart from that, everything else was either homestays or individual-owned bed and breakfasts or inns. We visited a few along the street and after gawking at the decrepit state of some of the accommodations, finally settled on Surfer’s Inn with its gracious host, we refer to only as ‘Pak’. Paddling into Inside Gerupuk, or what is also known as Bumbang Bay, was as welcoming as a cup of shaved ice on a roasting afternoon. The boat ride to the break was quick, with fresh clean ocean waters spraying into your face and cooling off the effects of a scorching sun. You could not be more grateful for that! The waters were as warm as can be expected of the tropics, and the swell coming in from the southwest lends itself to the creation of some very nice sets of a right-hand breaking waves. We were accompanied by about 6 other boats anchored just outside, and were grateful that we chose 7 foot mini-mals and could remain outside with the long-boarders. Our boat drivers only had small shortboards, but seeing their tanned skin told us that they have had enough practice on these waves to be able to catch them whenever and wherever. As I was paddling into position and about to take off on an oncoming peak, I heard a wheezing sound and felt a spraying of water to my face. I turned my head to my left and had to sit back up and drag my board back from taking off. The man who took that wave turned out to be Edie of Gerupuk, who owned the shop we rented our boards from and the boats that took us there. More than grudging that he ‘stole’ a wave from me, I was secretly grudging the life he has–surfing all and any day! After quenching our thirst for surf, we searched for a nice-looking place to fill our hunger for nourishment. We stumbled on something more than that. Ashtari Inn is solitarily located on the top of a hill, overlooking the bays of Kuta. The food was monastic but the views were magnificently extravagant. Lounging on the mats, leisurely plunging organic food down our mouths and occasionally walking into the balcony for the views, each one of our senses felt truly stimulated and alive. The next day, it was a road trip hunt for Mawi. We did not have a map with us, and equipped with only our sense of direction and the knowledge that Mawi was west of Kuta, we ventured on the old, potholed, single-laned roads of south Lombok. Luckily there were subtle road signs–probably left by previous visitors to the spots–to show us the way. Mawi is a nice reef break that offers hollow lefts and rights on small days, but on heavier days it was rumoured to be a “heaving left barrel, with elevator drops and heavy hold downs.” On that particular day, it was ranging somewhere in between 6ft and 10ft and being undecided about the conditions ourselves, we were happy to watch some of the local and foreign surfers rip it up. Perhaps next time when we return I will have gathered enough experience and balls to go in myself! – an environmental and community-uplifting initiative began by a surfer who visited Lombok. Bali seems idyllic. I would loved to have seen it 30 years ago!